Hiya guys! At long last I'm pleased to bring out the first mission for my Starcraft: Time Splitters campaign. Its my first project in the map making business. Here you can give me feedback on the missions (and/or the mod). Please report bugs that you come across, however please take a small look at the bottom of this post because there's several thing I'm already aware of. Also, please let me know what you think about the map. What do you like, what do you think requires attention. If you happen to have suggestions or ideas I'm also open for them. I hope you have fun playing. [Edit] Required mod-file and first map now uploaded and awaiting approval. Hey nice! Conratz on finishing the first Map. It's a solid entry for someone starting to dip their toes into the campaign pool, but it needs some work. The various units are cool. The attack animations/design on some of them are just mind-blowing (The Silent in particular wows me). Think that staying at 1 unit is a bit boring. In fights you spam your abilities at the start, and just watch him autoattack. 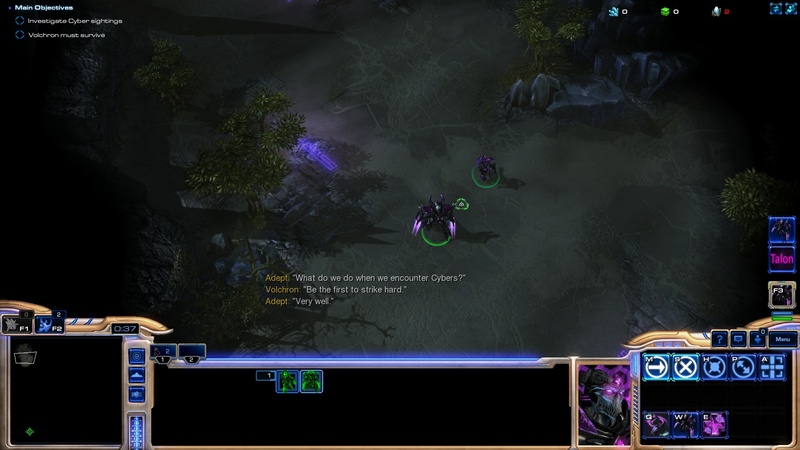 Defense was the highest note of the map because of you had to be constantly on the lookout with a number of units. Terraining could use a bit of work as well. Flat, open terrain is useful, but provides no interesting tactical characteristics or adds any character to the map. You've set up this mixture of Khalai/Tal'darim culture, but it's only touched upon in the f12 menu and load screen. The characters dialogue doesn't help with this, fluttering confusingly between terran-speak ("we need backup" is more terran than the classic zealot line "WE CANNOT HOLD") and generic angry-zealot-toss. Also, your lines don't need "" around them. Boss may need an indicator for phase change, you can be bursted down if you don't expect the purification novas. Boss also needs to do more (1 easily dodgable small area doesn't cut it) and have less shield uptime. Hello. very nice first mission and very awesome model. - A hero can not have a lower priority than a unit in a group. The first unit in a group must be the heroes. 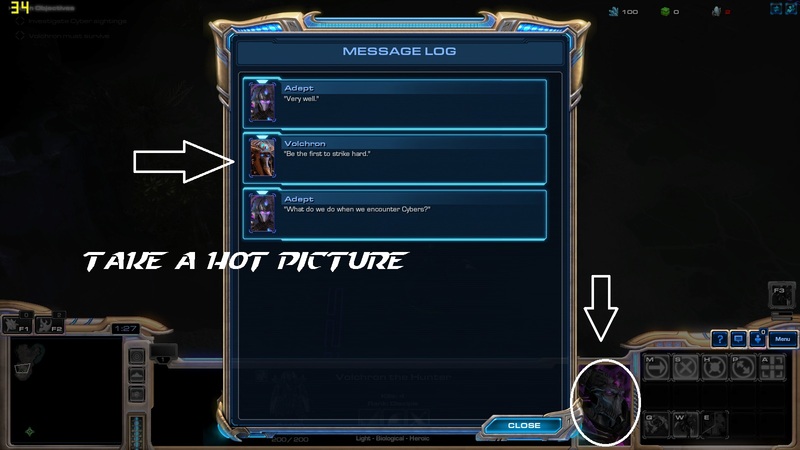 - In the message log you should change the static picture of your new unit. - Also I saw that you have oof the "show eeror during test document"
- The step from the game to a cinematics is very abrupt. It seems strange that at one point I am down on the map and then I appear with the "killer adepts" in the center of that part. - Also your hero has 200 energy but all hes abilities are on cooldown. Thanks for the feedback so far. Much appreciated! 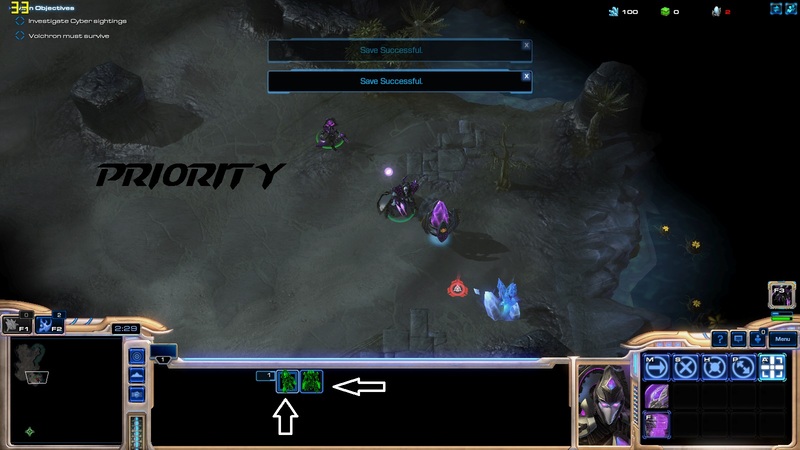 The issues with energy, priorityand static portraits are fixed in the modfile. And thanks for pointing out the error thing. I must've looked like an hour if I could resolve the boss bar thing, but this is just as good I reckon. 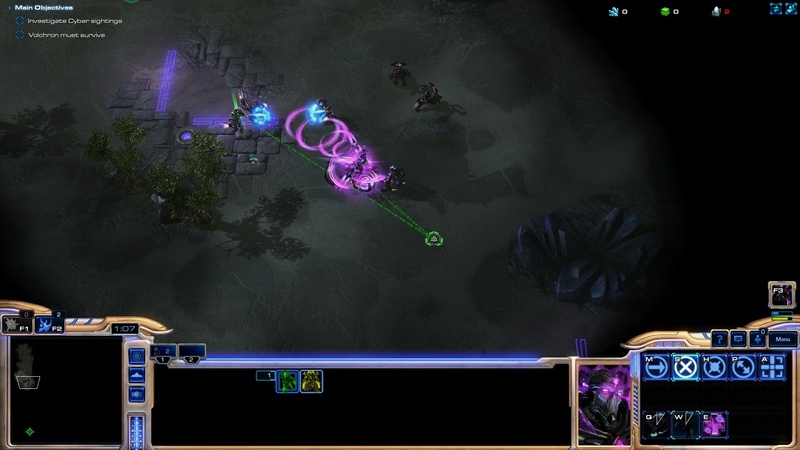 With regards to the dialogue I'll see where I can resolve the terranish style and make it more Protoss in general. About the terrain, Same thing here, I can see how I may increase on that a bit, but I rather not place too much clutter. But maybe some elements that show the Talon have lived there can work. I'll see what I do. And with the Boss fight, I agree that in retrospect it may be too easy (even I can beat it). But I'm not really a big fan of giving off warnings for everything. I feel this should also be a bit of player discovery. But giving it some more tools and diversity I can certainly look into. That should also help in the shield uptime. but it can be that randomization may have favoured the shield more that time (depending on amount of playthroughs). [Edit] Do you think it would help if damage from Volchrons abilities is reduced, say 50/s for Whirlwind and 100 for Dash? Anyway, once again: thanks for the feedback. Well, I've play your 1st map. Considering that this is your 1st map, I dare say that you actually did very well. Nice touch with the custom loading screen, give the player some idea of what to be expected from the map. For 1st time map maker, those are actually good terraining. But perhaps you might want to consider adding more trees or rocks. Feel very barren in some areas. And also, perhaps add weather FX such as rain or fog in certain area to give more immerse feeling for the environment. Custom units ! I've seen most of them in your project page, but seems you add more for this campaign. The Vindicator got to be my favorite of them. Also nice touch with adding custom portraits for the units. Give unique feel to the Faction. Specially like the custom adept portrait. Hmmm ..., I dare not say, since what considered easy for some could be consider difficult for others. But FYI, I only need to load once during Disruptor boss fight. Nice work on the cameras ! Good angle, and nice pacing. But .. perhaps you want to consider smother transition between gameplay and cinematic? Also perhaps remove the "" from the conversation / dialogue ? "Oblivion have in store for The Cybers ." Hope to see more Time Splitters in the Future. Hey, I just played your first mission. Overall, I really liked it. Here's my feedback to you! I like the intro cinematic. It was very simple, yet surprisingly effective. The slow camera pans combined with the atmosphere of the map and the music really drew me in, and I didn't need a long introduction. I'm a sucker for custom units, and you didn’t just make the custom units, you went all the way, making custom portraits, ability icons, wireframes and everything. Very nice job! I like Volchron as a hero. I'd argue that his Whirlwind ability is a bit too strong. It absolutely destroys every unit that gets thrown at you, and makes quick work of the boss too. Volchron also has energy, but he's entirely cooldown-based. There's really no reason for the energy to be there. I found this quite odd. One last thing about Volchron, he actually has the lowest subgroup of all the units you have. I think when selecting a group of units, the heroes should ALWAYS appear first. Some problems I do wanna point out about the custom units, is there tooltips. 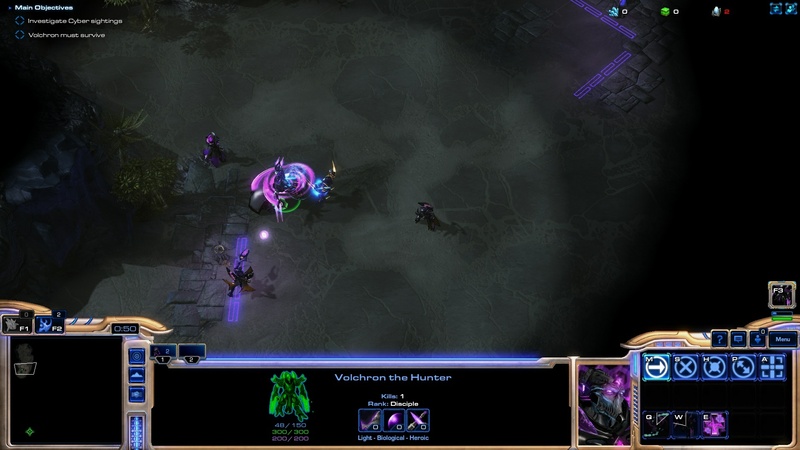 For example, the tooltip for the Paladin states that it can use blink, but I don’t have the blink ability available. Also, the Hunter tooltip states that it can Charge, but it can’t. It seems you just forgot to edit the tooltips of those units. Also, the Cyber Core’s tooltip says it contains the Warp Gate upgrade, so overall, just make sure the units have the appropriate descriptions. I found the terraining to be very unique. I quite liked it. 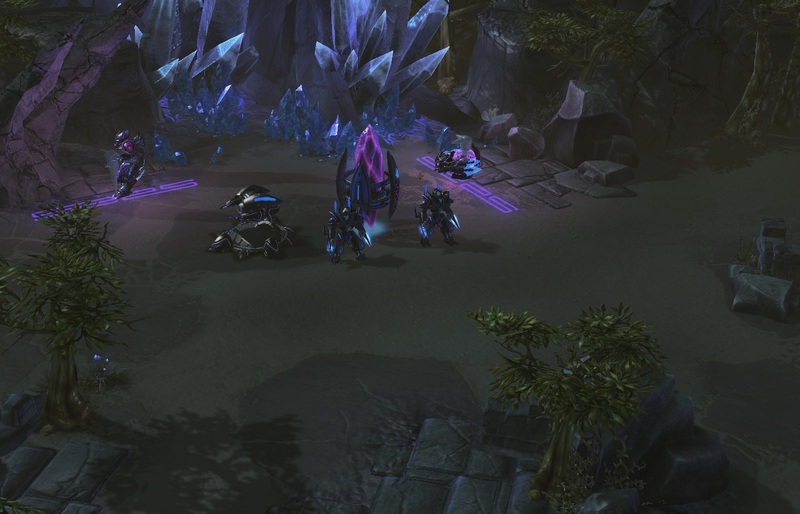 I do think, considering that this is a micro mission, the open areas were unnecessarily large. The size of the areas you explore could be reduced just slightly. 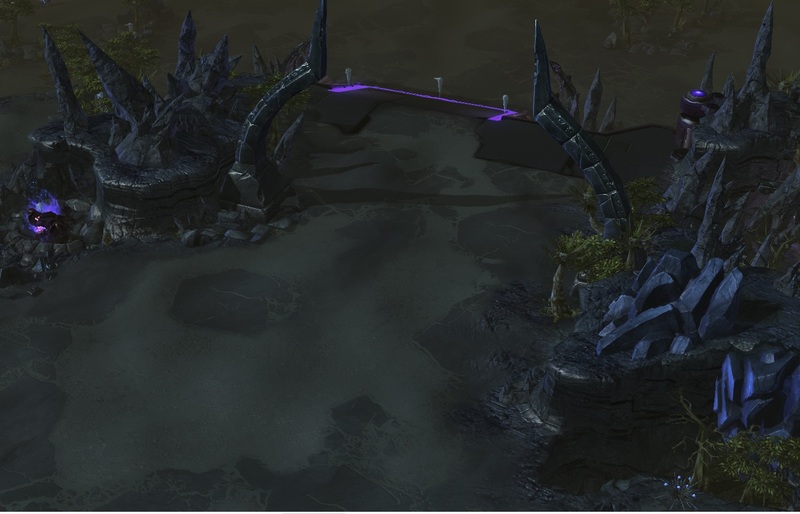 I'm not asking you to rework the entire terrain just to change this, but I'll just point it out as a reminder for future missions. 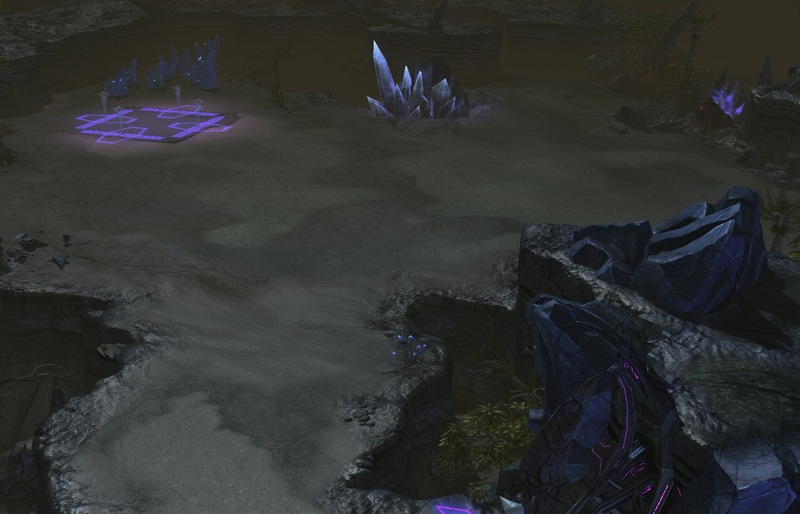 Also, some of the areas after the midgame cinematic was quite barren compared to what I saw in the first section. I would put a little more tension to detail there. Especially since the lack of it makes the areas seem way bigger than they actually are. The boss was really fun. I would say maybe making the targeting reticles for the boss more apparent. Black blends in with the terrain a little too well that they’re often hard to see. 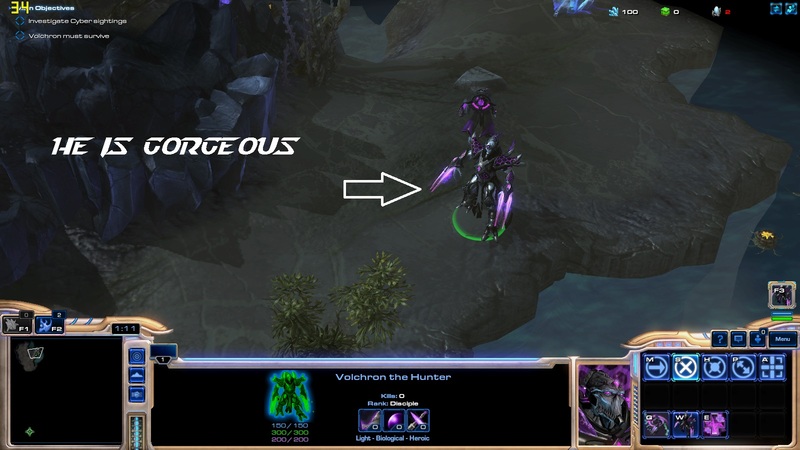 The Disruptor blasts that appear towards the end also needs to have some sort of indicator, or a warning. Something, at least. Since you’re in melee range to deal with the boss, the blasts kill you almost instantly. Theres no way to know when they will come. Unless I didn't get the boss's patterns. When I open the map, the little bug window appears at the top of the screen. This can be removed under the Map > Map Info tab. Would love to see a difficulty selection to this. I found the difficulty was good, but just to accomodate to other players' skill levels. This is a minor thing, but I like to hide resources and the supply frame for missions or sections of missions where its not needed, as it’s basically just wasted UI-space. Since you do make use of the resources, just hiding the supply Frame is good enough, I think. Oh, and the resource trading and alliances menu I would remove too. Especially the alliance menu since that can actually give the player spoilers as to which factions etc you’ll be encountering. Since we already know when someone is speaking, you don’t need the quotation (“”) marks on every dialogue line. The cinematics start very abruptly. I recommend doing a fade out over 1-2 seconds so it looks smoother. Similar to how it looks when the cinematics end. Good luck on this project! It looks very interesting so far! Hiya guys, a small update from my side as I'm working to solve/handle most points that are mentioned. - Currently working to decrease the open size of the terrain a little, about 25% with that. - Also working on the dialogue, both with style and removing the quotes. (this was also some I carrie over from SC1 I think, I always did that there also. - With the cinematics, I noticed now that while I had it set to a 2 second fade-out, I had the "dont wait" action in there. this is now fixed. And aahh, the tooltips. Yeah considering this is a first mission, I chose for most special abilities for the units to not yet be available. But I will edit the tooltips accordingly. Accompanied by this I've also released an updated version of the mod that must be used to play the map. A definite improvement from version 1 in all cases.. Sorry for the very late feedback for the new version. It's been one crazy week here. With asian games coming up, the government trying to reduce traffic jam by implement 'even' and 'odd' license plate that can and may enter certain streets. - I've take a look at the new version, great addition with the difficulty selection screen. 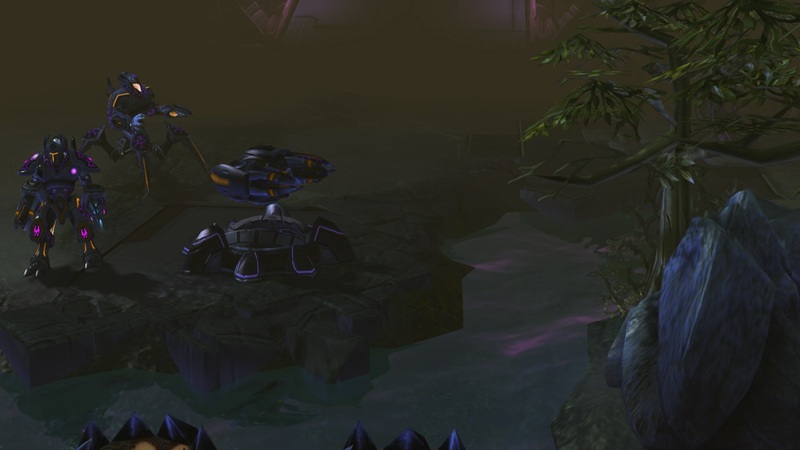 - I notice there are slightly change with the terrain, but still retain the doodads from earlier map. Nice touch with adding rain emiter btw! Loving the feel of the campaign even more. - I also notice you remove the "" on the conversation, good call imo. Overall, I feel that this is a definite improvement from the previous version. Sorry for a uniquely late reply to all this. I'm glad you guys like what it has become. I'll try to make the boss fight even more interesting and unique per difficulty level. Once again! Thanks so much. In the mean time I'm trying to spend time to get map 2 into shape. Been a while since last saw you here. Will you be joining Maporino? Thanks mate. Yeah I know, shame on me. Well, I would certainly love to, but I have great fear that I dont have the time to spare. I often times struggling in that department already. A small update from my side regarding this project, But first my sincerest thanks to everyone who has helped me get this underway. Thanks for the feedback making me create better map(s). Without further ado, the first map has received some slight polishing to the endgame unit and hereby is properly released and awaiting approval. Then, the second map, and conclusion of the prologue is underway as well. Attached are a few screenshots of the terraining and potential loading image. As the images make clear, the map takes place directly after the first mission. Thanks mate, have you been able to play the first map by any chance? Haha, alright no worries. Maybe I can get the second map out in time so that that follows back to back. Progress isn't bad. Yesterday I tried a general playthrough for some alround difficulty settings. Most of the triggering is in place now. Also seeing if I need to do some added terraining. Because this one will be macro based map, I'm still looking for a good balance between open space and doodads. This is a bit late, but since you are a map maker now, how would you like to join the custom campaign initiative ?